There is more information available on this subject at Astroengineering on the English Wikipedia. The Ark and the 7 Halo rings. Astroengineering is name given to the construction of megastructures in space by technologically advanced beings. It is a form of megascale engineering, but deals with structures that are "easily observable" from interstellar distances with 20th century astronomical instruments: e.g. a space elevator is an example of megascale engineering, but it is not an example of astroengineering. A notable example of astroengineering are the Halo rings, built by the technologically advanced Forerunners. Construction of these megastructures seems to be restricted to either Tier One or Tier Two civilizations. A Tier Three civilization, the UNSC has no known astroengineered structures. Installation 05, the second Halo discovered by the UNSC and the Covenant. The Forerunners are renowned for their mimicry of natural environments, but it is their engineering achievements that stand as monuments to their extraordinary prowess, centuries after they have passed on. Their Halo Installations, shield worlds, and the Ark are all artificial habitats on a vastly larger scale than anything that either humanity or the Covenant could have accomplished. Forerunner megastructures were typically designed by members of the Builder rate and constructed by the Huragok as well as a wide range of automatons ranging from diminutive Constructors to colossal Retriever Sentinels. Meanwhile, the Miners were tasked with stellar and planetary engineering. The Halo installations are planet-sized artificial worlds, shaped like a ring. The interior surface contains a breathable atmosphere and seemingly natural terrain, including oceans, lakes, mountains, forests, and tundras. Underneath this is a support layer, upon which this terrain has been put in place, consisting of a vast grid network of metallic plates that provide the base. The Earth-like gravity on a Halo installation is provided by the centripetal force of the ring's spin as well as an artificial gravity field. The Halos were constructed as weapons of mass destruction on a galactic scale, designed to kill all sentient lifeforms in their radius of effect, approximately 25,000 light-years, by firing a harmonic pulse of cross-phased supermassive neutrinos. Artificial planet Onyx, before its destruction. 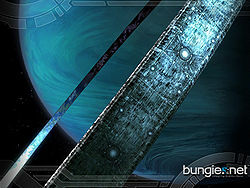 The Forerunners were also adept at creating artificial planets in a variety of ways. They were capable of speeding up natural planetary formation by collapsing an asteroid field into a molten mass of a twenty-megameter range, and then form it into a protoplanet which could be fully cooled in less than ten thousand years. In addition, they employed other methods to construct planetary-scale megastructures, such as Onyx. Internally, Onyx's structure was maintained by, and even composed of, trillions of Sentinels and at least one immense Sentinel constructor factory, while externally the planet can appear like many other terrestrial planets, with a wide variety of terrain. A variation of the concept also exists, built in a more conventional fashion. Employed in a variation of the shield world concept known as a conservation sphere, this variation is a structure whose surface is composed of an outer shell, with a hollow interior and a habitable inner surface, and a miniaturized artificial star in the center. The interior resembles a Dyson sphere, though on a far smaller scale. The artificial planet Onyx was used as a cover for the slipspace-based Shield World in its core. It was later colonized by the UNSC, oblivious as to its true origins until 2552, when its Sentinels activated to defend the Shield World. It was later damaged by FENRIS nuclear warheads, and destroyed as its Sentinels burst free and set up defensive stations around the Shield World portal. This shield installation was representative of a smaller variation of the shield world concept. Known as a conservation sphere, the facility consisted of a hollow spherical shell with a terraformed inner surface and an internal sun. The installation's outer surface was heavily infested by the Flood. It was destroyed by the UNSC forces in 2531 when the overloaded Slipspace drive of UNSC Spirit of Fire sent the internal star to supernova state. The Forerunners also constructed massive Dyson spheres, such as the shield world known as Shield World 006 held within Onyx. With a diameter of 2 astronomical units, this shield world was encapsulated in a Slipspace field to protect the occupants from the Halo Array as it activated. Essentially a sphere, with its habitable surface on its internal surface rather than external, these "micro" Dyson spheres are also equipped with their own stars, providing warmth, light and energy to the installation. Originally intended as a way to circumvent the Halo effect, the shield worlds were not put into use by the Forerunners due to the rampant actions of one of their own AI constructs. The interior of Shield 0459 was essentially a variation of this concept, albeit on a far smaller scale and not enveloped in slipspace. Installation 00 is a Forerunner megastructure vaguely similar to an Alderson disk in overall shape. With a diameter of 127,530 kilometers, and a larger total surface area than a Halo installation, it incorporates many similar elements, including Earth-like gravity and atmosphere and a rich and diverse ecosystem. Located in the center of the installation is a small planetoid, used for raw materials, and a star orbiting nearby despite its location: 218, or 262,144 light years outside of the Milky Way Galaxy, where stars cannot naturally form. It is possible that this is an artificial sun created by the Forerunners. Rather than being a superweapon, like the Halos, the Ark functions as the control center of the Halo Array. It also served as the lead researching station for the Librarian and as a construction facility for Halos, using the planetoid to provide metals, gases, elements and other resources needed for reconstruction. After the construction is complete, the Halo is transported to its destination via a Slipspace portal. Originally, an even larger Ark facility existed, known as the greater Ark. This second Ark was used to construct and repair a series of larger Halo rings. Though it differed from Installation 00 in a number of respects, it shared its general flower-like shape and was similarly located outside the galaxy. The Forerunners had the ability to harness the energy output of an entire star by using containment and collection fields; dozens of stars had been harnessed for energy production this way. Forerunners stellar engineers nicknamed "plasma jockeys" also experimented with controlling young stars, attempting to "tame" them for future use. 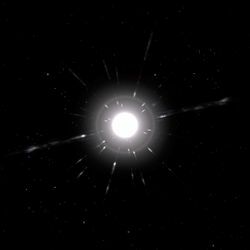 The Forerunners could also either create artificial stars, or move existing stars across distances of thousands of light years, either of which would be a tremendous technological feat. Additionally, they were able to extrude whole stars into slipspace. One star was used in the construction of the Shield World, Shield World 006, while an artificial star, created just for it, orbited Installation 00. Shield World 0459 also had a miniaturized artificial star in its center. "A Halo’s construction is executed by armies of Sentinels: some are the size of cities. Viewing the picture of the reconstituted asteroid material, you can see the process of skinning the Halo. There are four huge terraforming factories moving across the face of the Halo. They hold in the atmosphere which would leak out across the face, eventually pouring through the super structure, tugged into place by centrifugal force." The exact methods used by the Forerunners to construct their artificial worlds is unknown. Presumably, large numbers of various types of Sentinels play a role in the construction process, laying down the initial structure. Over this is laid a vast network of scaffolding, over which the artificial environment is placed, including earth, rocks, and significant quantities of water. Some terrain patterns deemed particularly pleasing were repeated in different locales and installations, often with some degree of minor variation to the base template. As a result, separate Forerunner sites may house near-identical environments, an example of which is Two Giants on Requiem and several analogous sites on Installations 00 and Installation 04. The Ark plays a significant and noteworthy part in construction, and is the location where replacement Halo Installations are built and later transported, should one be destroyed by the Flood or opposing forces. Though on a far smaller scale, the Covenant have been known to build superstructures. High Charity was the Covenant capital city prior to 2552. Presumed to be built around a chunk of rock taken from the San'Shyuum's home planet, it was not only an artificial planet, but capable of traveling through slipspace, powered by a surviving Keyship known to the Covenant as the Forerunner Dreadnought. It was the largest known Covenant artificial planetoid, at 348 kilometers in diameter, as well as the home of the majority of the San'Shyuum population, and was infested by the Flood, and eventually destroyed in the Battle of Installation 00. The Unyielding Hierophant was a mobile space station used as a fleet command center and refit platform. Approximately 30 kilometers long and 10km in circumference, with two bulbous sections joined by a docking ring at the middle, it was a significant Covenant military base in the region, capable of resupplying up to 500 warships and carried thousands of Covenant personnel internally, including Banshee and Wraith pilots. It was destroyed by members of Spartan Blue Team during Operation: FIRST STRIKE. While 26th-century humanity does not possess the technology required to construct megastructures on the scale of the Covenant or the Forerunners, they have built several habitats within mined-out asteroids. The Rubble was a complex structure comprised of hundreds of asteroids, located in a Lagrange point between the gas giant Hesiod and its moon, Metisette. The habitats were made up of many asteroids that were linked together with docking tubes. Each of these asteroids had its own means of propulsion, and they were kept together by the machinations and calculations of the AI Juliana. She had been operating far past her normal 7 year life span and was rampant, but she had to remain in operation because the tasks that she performed were too difficult for humans. The asteroids that made up the Rubble were mined and constructed by a mix of Kig-yar and humans. The humans that lived on The Rubble were either insurrectionists, sympathizers or surviving colonists from the colony world Madrigal. Built inside a hollowed out asteroid in the Eridanus system, the Eridanus cell of the Insurrectionists hid here until their leader, Colonel Watts was captured by members of the SPARTAN-II Program. It had several factories, schools, hotels and even a hospital built inside it as well as a large docking bay. It was later destroyed by a Covenant fleet in 2552. The long-vanished beings known as the Precursors were known to have built megastructures unequaled by even the Forerunners. These included various massive constructs known as unbending filaments which could be used to link entire star systems. Once a major Precursor world, Charum Hakkor once housed many feats of Precursor engineering. 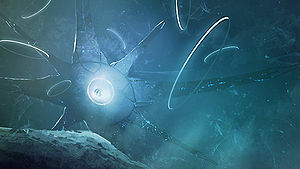 Precursor technology was based upon what the Forerunners called neural physics, the specifics of which are largely unknown but which allowed them to make their creations virtually indestructible. However, it also rendered Precursor construction susceptible to the Halo effect. As a result, most, if not all, feats of Precursor megascale engineering were supposedly destroyed by the galaxy-wide firing of the Halos. The foundational scaffolding beneath a Halo installation's terrestrial surface. Scaffolding islands of a Halo installation. Early concept art of the Ark. A mountain range on the Ark in panorama. A planet with twelve moons, each containing design seeds. ↑ Halo Waypoint: How Did Valhalla Get to Requiem?